Along with my love of modeling and presenting… I am also very crafty. I own a craft studio and host classes and charity events monthly. I love to inspire the ladies to create and share. I am also growing my online presence by creating and editing my own video tutorials. Check this one out! This card features the Stampin Up Field Flower stamp set. It’s so pretty! I needed another card for my Stamp Camp so I turned to my handy Stampin Up catalog for ideas and inspiration. As I was flipping through I saw this card. I decided to give it a try. For the most part I C.A.S.E.D. (copy and share everything) it as is; however, I’ll share with you a couple changes to make it my own. The base of my card is actually chocolate chip. I also used whisper white and primrose petals. To make the two tone primrose petals flowers I inked up my flower and stamped it off and then onto my good card stock. I did the same technique with the lighter flower. The only difference is I stamped the flower off a couple more times before stamping it on my card stock. I used lucky limeade for the stem… Stampin it off first. I used early espresso for my So Sorry. After trying my sentiment various ways I ended up liking this way the best. With the “you’ve been ill” in primrose petals. I cut the sentiment and popped it up for interest. 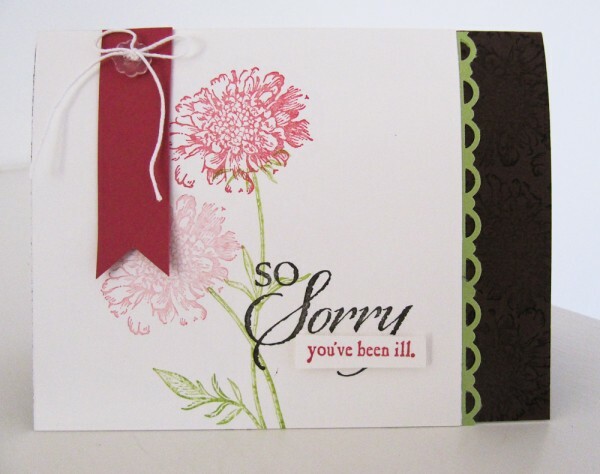 The inside is my favorite part of my Stampin Up Field Flowers get well card. I tried all sizes of tissue boxes. I ended up really liking this one. 3″x 5″. You score the long side or 5″ side at 1″, 2-1/2″, and 3-1/2″. After I scored my card stock I stamped it with primrose petals. After you fold and prep your score line you must punch the hole for your tissue first. The punch doesn’t reach far enough to center your hole… so I fold a 1″ side on top of the 1-1/2″ side center and punch the top of your tissue box. 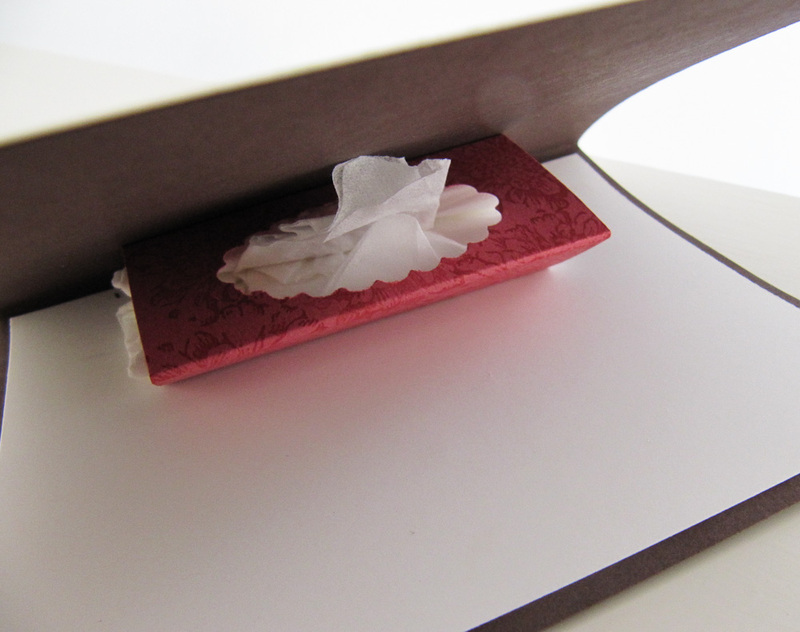 Glue two sides of your tissue box in your card so the your decorative punch section is on top and the other punched piece is against the top flap of the card. 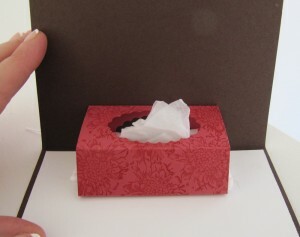 Add your tissue and you have an adorable Kleenex box inside your “Get Well” card. That’s it! Thanks for stopping by. Have a blessed day and shine bright! Previous post: CES – Hisense Electric Corp.